If the stock footage of monkeys, a black panther, a leopard, a komodo dragon and an anaconda (most of which don't even reside on the same continent, let alone the same jungle) isn't enough to clue us in, the narrator makes sure to insult our intelligence even further with the first three words out of his mouth: "This. Is. Jungle." Yes kids, this is the jungle, where our wise doctor hero anticipates the overheated melodrama we are about to see when he proclaims "White people shouldn't live too long in the jungle." Klaas Van Gelder (Paul Cavanagh) is one such man who's been in the jungle too long. Busy with his books and plantation, his health has taken a hit and he's been a bit neglectful of his much-younger blonde wife Dina (Barbara Payton), who's forced to spend her evenings all alone. The marriage is on the rocks but things start getting more complicated once Klaas realizes that Dina is attracted to macho Barney Chavez (Raymond Burr), who's been hired to run the plantation, and vice versa. He fires Barney and insist he leave his home immediately. Later that night while no one else is around, punches are traded and Barney knocks Klaas to the ground, where a venomous snake bites and kills him. Klaas' elderly, eavesdropping female servant Al-Long (Gisela Werbisek) witnesses Klaas' death and decides to get revenge on Barney, and not just for killing her employer, but also for jilting her daughter Larina (Carol Varga), who'd fallen in love with the brutish Barney only to be pushed away for the other woman. Using leaves from "the plant of evil," which is toxic and illegal in those parts, Al-Long is able to place the curse of the beast on Barney. It isn't long after Klaas' death, which is officially written off as an accident, that Dina and Barney plan to be married. Dr. Viet (Tom Conway), who's skeptical that his friend Klaus' death was accidental (and is ALSO in love with Dina), along with Police Commissioner Taro (Lon Chaney Jr.), who was born and bred in the area but spent so much time away at university he now feels out of touch with the superstitions of his native land, decide to investigate matters. Barney starts behaving strangely and wanders off into the jungle at night, sometimes returning days later a blubbering, hysterical mess. All the while, animals in the area are turning up dead and natives report sightings of a "sukara;" a hairy, clawed, ape-like jungle demon. This 'B' programmer falls into one of those weird gray areas between semi-respectable and all out camp. It's made with enough basic skill to avoid being an unintentional laugh riot, yet it's not made well-enough to be a low-budget diamond in the rough. In other words, those looking for their next camp classic are better off looking elsewhere. The acting is fine, the dialogue is somewhat sober and there's a fair - though not very original - storyline. On the downside, there's not nearly enough monkey action. In fact, the "gorilla" is only seen a couple of times and it's usually upside down reflected in a pool of water. It also only runs 65 minutes, which apparently wasn't enough time to come up with a half-way decent ending (the one it's saddled with now is pretty anti-climactic). There's next to no suspense, very little horror, action or excitement; just lots of talk really. I suppose Conway - who'd starred in the excellent Val Lewton productions CAT PEOPLE and I WALKED WITH A ZOMBIE less than a decade earlier (in 1943) - is "slumming" in this one, but he's fine in his role. Ditto for very attractive, ill-fated starlet Payton (who was romantically linked to Conway for a brief time off-screen), aging horror king Chaney and future Perry Mason Burr (who'd return for more gorilla fun in 1954's GORILLA AT LARGE and face an even more threatening monster in GODZILLA, KING OF THE MONSTERS a few years later). A young Woody Strode (whom Payton was also romantically linked to!) has one scene as a policeman. Director Siodmak (who also scripted) would revisit the Amazon (or at least jungle sets posing as such) with CURUCU, BEAST OF THE AMAZON (1956). An easy-to-find public domain title, this has been released on multi-movie packs for years. 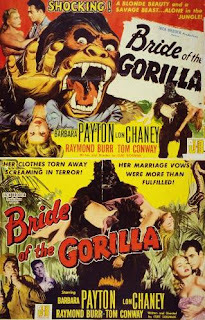 Labels: ape/gorilla/monkey, curse, demon, jungle, Lon Chaney Jr.